Hi everyone! Today I want to share with you how I’ve been keeping my hair sleek and straight these past few weeks. My hair dries naturally frizzy, wavy, and unmanageable therefore straightening it is a must on most days. Now don’t get me wrong, I also embrace my hair just the way it is and often leave it au naturel. But for days where I’m after a polished finished look, I have been opting for my much loved heat styling tools. Enter Saint Algue: I’ve recently had the opportunity to try out some of their amazing range of products to help revive my hair. Today my ‘mane’ objective is to bring awareness to their fantastic hair tools and treatments. About the brand: Established in 1977 Saint Algue salons look at life in a responsible way and care for the planet, naturally. They are committed to implementing and promoting a policy of sustainable development through concrete actions: saving water, waste recycling, low energy consumption, and more. Awarded Best French Salon in 2015 and is the official salon for Miss France 2017 & 2018. I wash my hair no more than twice a week to get my locks to a healthier state. Then I prep it with a heat protectant product before picking up any of my hot hair styling tools. When using Saint Algue Demeliss Pro Hair Straightener Brush I spray Demeliss Spray Liss & Protect to enrich hydration, tame the frizz, protect hair from damage and smooth hair cuticles. I rely on Demeliss Keratin – Care, a nourishing cream to help repair and strengthen my tresses, keeping it frizz-free for days after using the Saint Algue Demeliss Steam. Lastly I finish off my hair with a bit of the Demeliss Serum, a smoothing leave-in treatment which transforms my hair to a soft, shiny finish. I’m not going to lie, I was a little skeptical about any hair straightening brush working on my thick unruly hair. 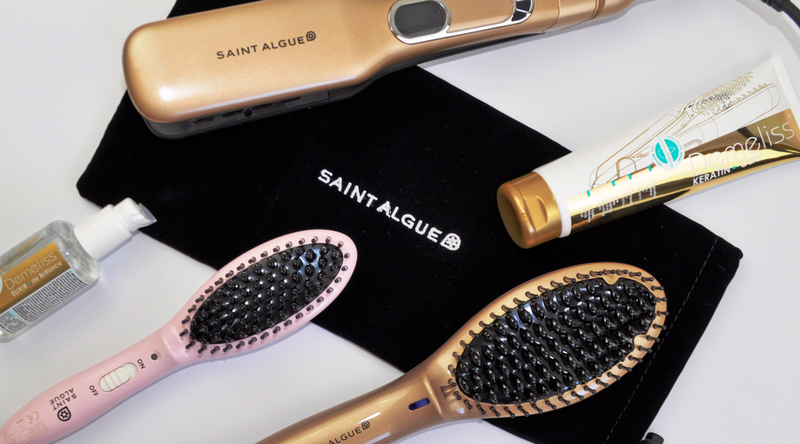 I’m pleased to say that I’m blown away by the Saint Algue Demeliss Pro Hair Straightener Brush. It replaces your conventional brush and traditional heat styling tool, to straighten hair in the most healthy way thanks to its intuitive brushing movement and special Ionic function which regulates the hair staticity for a longer time. The bristles heat up in minutes, then glide smoothly through my hair working its way to a straight shiny style. Tips: I suggest you section your hair before using any heat styling tool as it will save you time and give you a more polished look. Take a small section of hair and slide the brush gently and slowly combing from root to tip (You can also brush the strands of hair from the inside). Make sure you never keep the brush in the one same position for any more than 3 seconds. Energy saving feature shuts off automatically one hour after last use. Do you have any helpful hair care tips on how you straighten your hair? Let me know in the comments below! I don’t straighten my hair but these brushes look like they’d be more gentle than flat irons. These brushes look great! Plus there are soooo many pretty colours to choose from! Im so keen to try out a straightening brush! They look so easy!! Ooo I love the one with the tongs! That looks like it would be perfect for easy styling! I want to try one of those! I don’t need too straighten my hair but I am in the market for something like this for smoothing. I think I’d prefer that style of flat iron brush than the usual hair straightening brushes, love the design!! My hair is pretty manageable so I don’t need to style it much (only when I want to curl it), but I can imagine a straightening brush to be so good for quickly and easily taming frizz and making everything smoother! I am so much into straightening brushes, they are so easy to use and work so well. These sound so good and I like the packaging too. I want to try! One of my new years resolutions is to make more of an effort with my hair for work, I think one of these brushes will be the way to go!